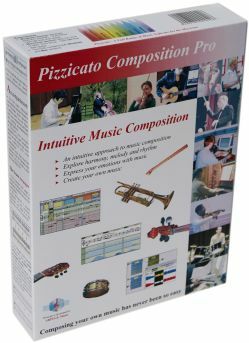 Pizzicato Composition Pro introduces the concept of intuitive music composition. This is where you can start exploring music composition like never before, from the solo instrument to the full orchestra. 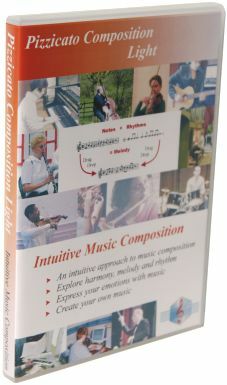 You will find innovative tools to explore harmony, melody and rhythm, as well as to arrange your own music. You have access to the most advanced composition tools of Pizzicato. You can graphically draw the shape of a melody. 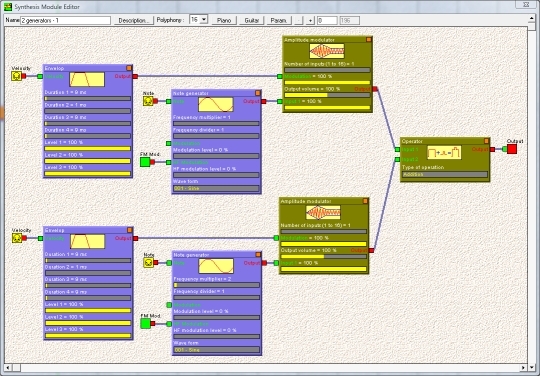 Never seen before - Intuitive composition tools make music composition available to everyone. Music composition is not only notation - Discover audio editing, sound creation, virtual synthesizers and a high quality sound library. 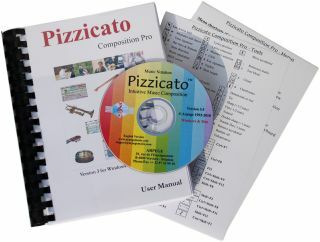 Pizzicato may be used as a stand-alone software or as a companion tool to any other music software. Melody - How can you find a melody? Harmony - How do you find chords? 5 - Your advantages - Why choosing Pizzicato? 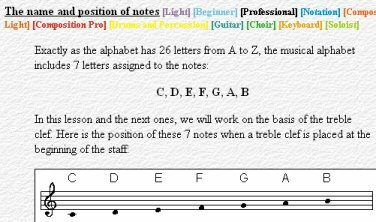 Even if Pizzicato Composition Pro does not handle page layout and printing of scores, it provides you several tools to work your music composition on the basis of standard music notation. 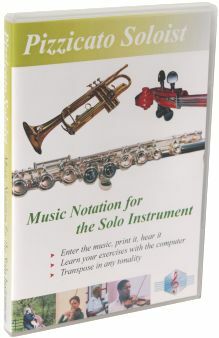 You can export your composition as a MIDI file, an audio (wave) file or as a musicXML file, for instance to burn a CD or prepare the page layout and printing of the score with a notation software like Finale, Sibelius or Notion. You can use all clefs (G, F, C, percussion), standard or transposed (8). Change the clef anywhere in the score. Create composite time signatures (3+4/8), advanced key signatures (mixing flats and sharps), free measures (with no time signature), multi-measure rests, and customize the measure appearance and content. 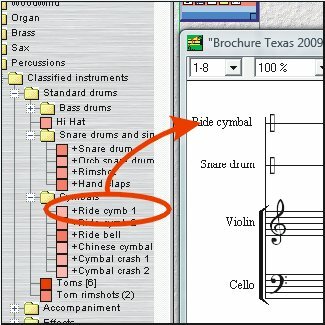 Pizzicato provides all the tools needed for drum notation. 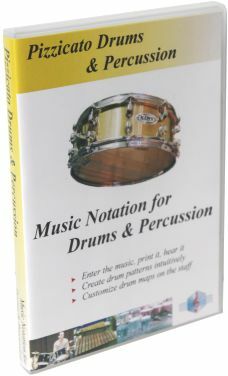 Note heads, staves with 1 to 16 lines, the percussion clef and MIDI mapping of instruments are combined to create nice looking drum parts. 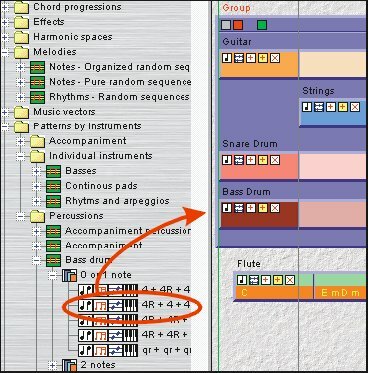 Pizzicato will import MIDI files and can split the individual drum instruments so that you can easily edit the parts. You can add custom symbols to the palettes and define their graphic aspect as well as their sound effects on the playback. A special copy/paste function helps you to merge staves together or to split apart an existing staff. Select the sounds assigned to instruments on the staves by using the standard GM/GS/XG lists of sounds or the sound lists of about 100 standard synthesizers. Customize the list of sounds for your synthesizer. You can synchronize audio tracks, select virtual instruments and edit the chord progression and associated scales. You can add one or more audio tracks and synchronize them with the score. You can record audio tracks to add an acoustic instrument, voices or sound effects. With the audio editor window, you can directly edit audio tracks. Operations like copy, paste, mix, echo, fade in & out, insert, remove, time inversion, spectral analysis and synthesis, and many others are available to edit the sound itself. 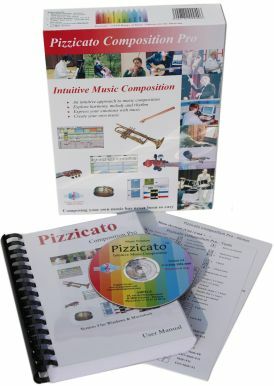 With Pizzicato, you can also express your creativity and imagination by creating new sounds to play your music. You can construct new sounds with a modular synthesizer, by assembling building blocks. Drag and drop the sounds directly into the score and hear the resulting playback. You can assign these sounds to any staff or measure of your composition. You can also import samples from the Internet as SoundFont files. 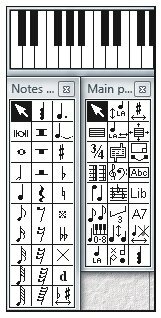 You can modify them and use them in your music composition. You can also import and export MusicXML files to exchange music scores with other music software. Pizzicato offers you many tools not available anywhere else. 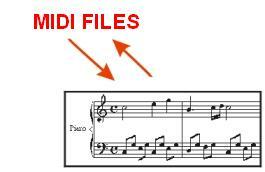 Using these file formats to exchange information, you can use Pizzicato as a companion tool to many other music programs. You can create an audio WAV file from any Pizzicato score, using the full quality of the integrated library or imported SoundFont samples. 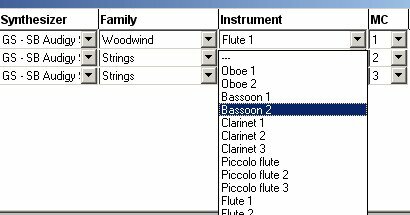 You can create an audio file for the full composition and also a separate audio file for each instrument. Composing music consists of finding an idea and structuring this idea into a full music composition. Pizzicato gives you a series of tools to find an idea and to develop this idea. It DOES NOT compose for you! You are the composer. These tools help you explore musical possibilities with unmatched ease. At every step of a music composition, you must make choices that will finally produce a unique composition. With Pizzicato, you make these choices with various practical tools that help you to sort out the possibilities by listening. Your choice is made according to your personal taste and to the atmosphere or the feelings you want your music to express. These tools form an intuitive composition environment. 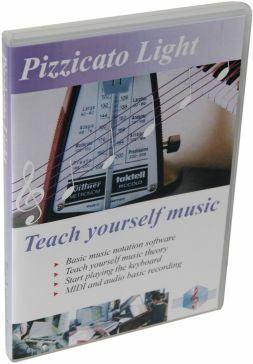 Pizzicato offers you a musical desktop on which you can easily and efficiently organize a music composition. Drag your preferred instruments directly into the score, including percussion instruments. 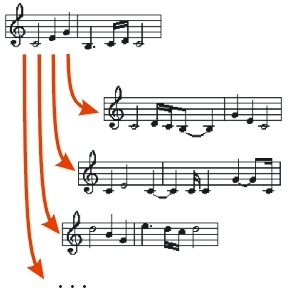 One of the intuitive composition principles is to drag and drop scores made out of one or several measures to construct a full composition. 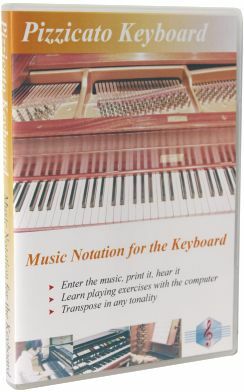 Each score may contain melodies, chords, accompaniments, instruments or effects, any of which can be combined. 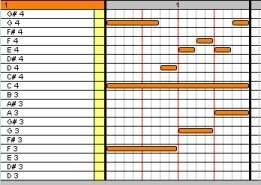 Combine, play and edit these music building blocks and create the first structure of your musical composition. 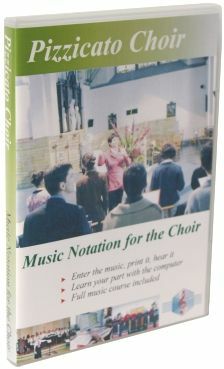 The result may be edited or customized in the score notation editor or in the graphic note editor. By playing an instrument or singing, you can find a melody that may become the starting point of your composition. 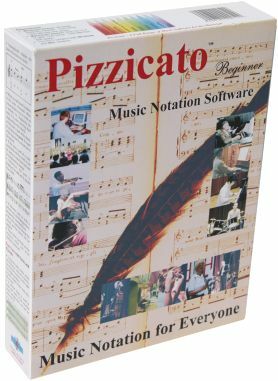 The Pizzicato libraries provide you with numerous note sequences and rhythm sequences that you can try and combine. The possible combination's are countless and will give you raw melodic material which you can adapt. 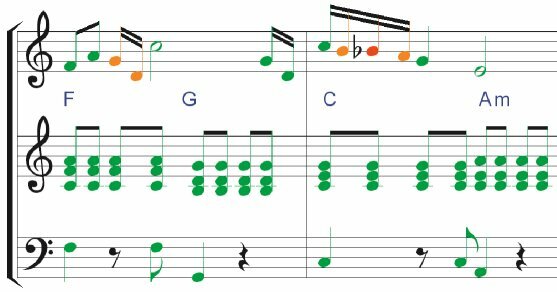 Starting with an existing melodic idea, you can work out several variations, based on simple rules that you can control, again multiplying the possible choices. 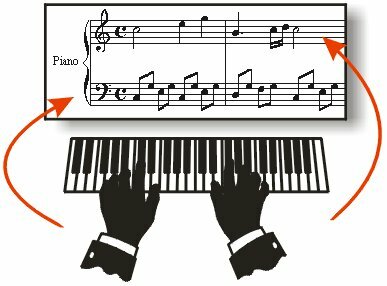 You can intuitively draw the shape of a melody on the staff and Pizzicato will transform it into a melody that matches that shape and the existing chords and scales. 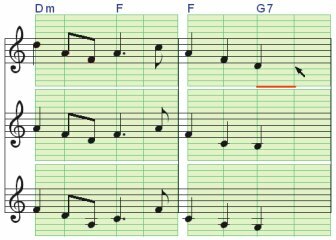 Similarly, you can click to cut or lengthen the note durations and structure the rhythm of the melodic line. 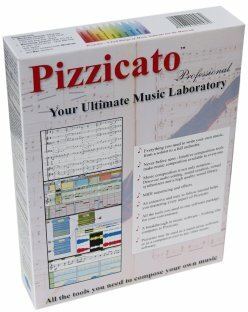 Pizzicato has thousands of prepared chord progressions that you can use and adapt according to your personal taste. 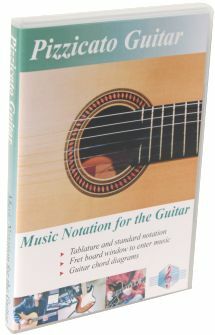 Navigate inside several hundreds of harmonic spaces available to you in the Pizzicato music libraries and create chord progressions intuitively. 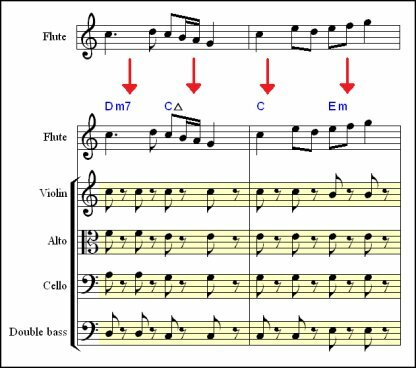 Harmonic spaces consist of chords that can be sequenced harmoniously. Listen to your composition while selecting chords and hear your music being adapted to fit the chords you select. 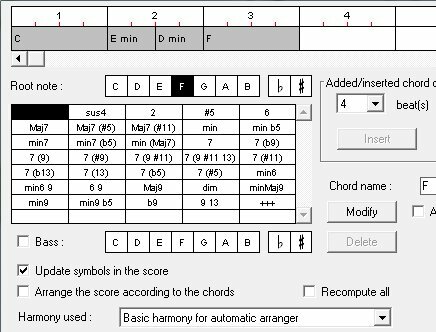 Create your own customized harmonic spaces, based on scales, degrees, chords and possible transitions. You can also create a harmonic space based on one or more files containing chords, so as to be able to compose a chord progression "in the style of...". 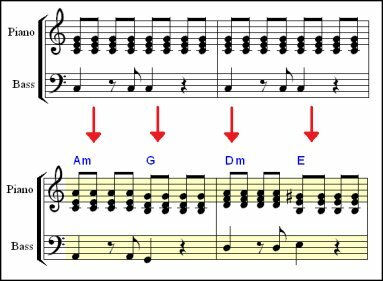 If you have a melody, Pizzicato offers you a chord analysis to find possible chords that can match that melody. As there are often many possibilities, a multiple choice is suggested for each chord, and you can select the one you prefer by listening. This function also provides a way to deduce the chords symbols from an existing score. 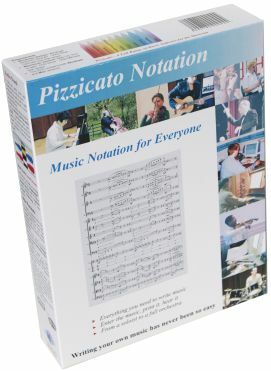 Use the many individual instrumental measures found in the Pizzicato music libraries. Combine them in a few clicks into your composition and hear the resulting accompaniment, including drums. 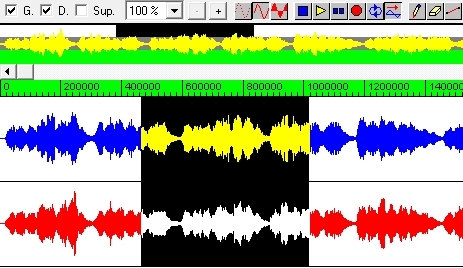 Without being an expert, you can easily create and edit a drum pattern. 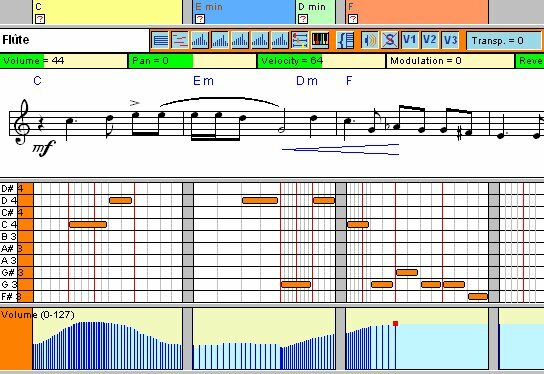 You can use the standard notation or the visual piano roll editor. Pizzicato can play the pattern in a loop while you edit it, so you can intuitively modify it until you like it. 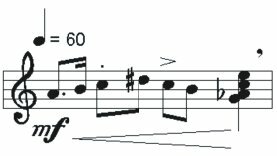 Pizzicato also provides prepared styles and variations that you can drag in the score and combine into your composition. You can also import style files from the Internet, with the Yamaha style format (.sty extension) or extract a style from a MIDI file and use it in your composition. 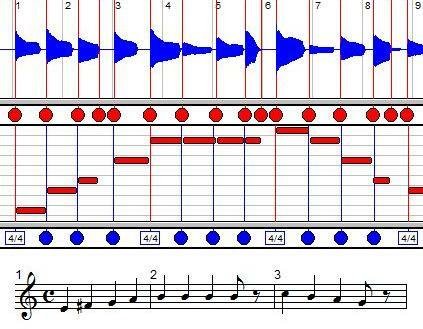 This function will adapt a musical structure to match the harmony (chord progression) of your music. By designing a simple structure of one measure, Pizzicato will adapt it to the harmony of your composition. The arranger works directly on the score. You can switch between the original and arranged versions. You can customize the rules of the arranger. 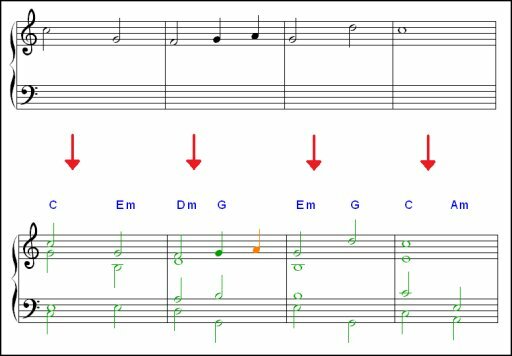 When you find a melody, you can do a chord analysis and add prepared structures like a string quartet or add secondary voices with rhythmic preferences. Pizzicato will arrange the score to match the chords.